It's heading to that time of year again. The shops are already decorated with fake pine trees, tinsel, flashing lights and it's 30 degrees Celsius out! I don't think I will ever get used to having Christmas in summer. This year I wanted to make a festive wreath for our front door, but nothing overly Christmasy and something that actually reflects the native environment we live in. What better foliage than eucalyptus! It's affordable (e.g. free), smells amazing and dries beautifully. 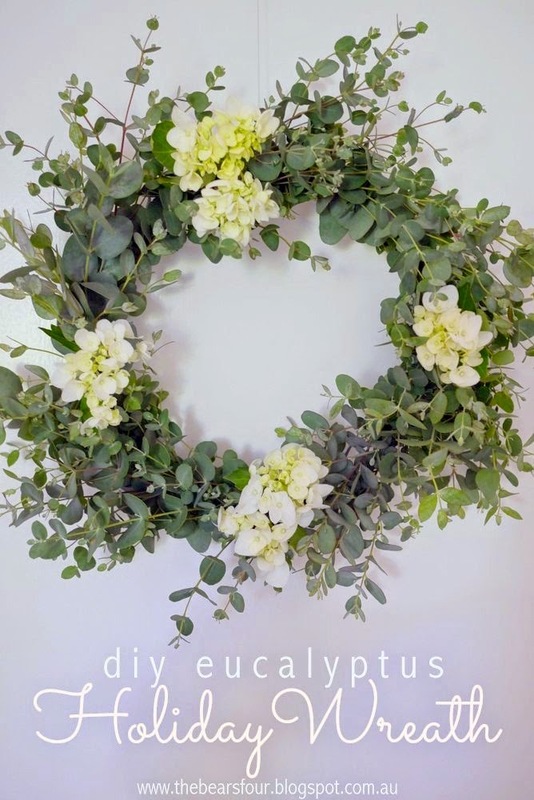 For a step by step on how to make your very own holiday wreath, read on. Fresh eucalyptus and flowers. The flowers are optional. I used white hydrangeas but if you want them to last for any length of time then you will need to use clear florist water vials. 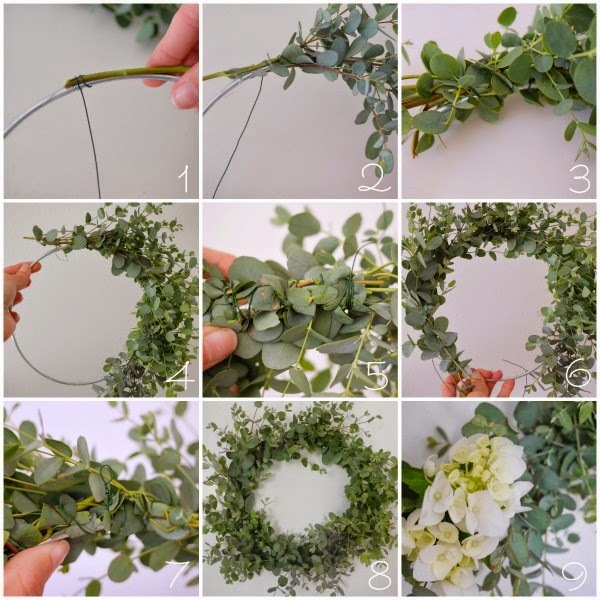 Now the steps to this are pretty much exactly like the steps to make the flower crown I posted about here, just on a slightly larger scale and with wire instead of florist tape. Step: Cut your eucalyptus down so you only have about 4-6cm (2 inches) of leaf free stem, then start by placing the stem on the wire ring. Cut a long length of florist wire and start wrapping the wire around the ring and stem. Step 2: Add another stem and continue around the ring. Step 3: Add extra foliage to hide the wire and make sure to keep adding the stems to the same side of the ring. Step 4: Once you're about half way around the ring, check for uniformity and add any extra stems or take away any to even everything up. Step 5: Continue going around the ring and securing the wire by wrapping around the ring several times. Step 6: Once you've gone all around the ring and are ready to place the last bunch of stems, make sure to tuck them into the foliage from where you started so you can hide the wire. Step 7: With the last of the wire, tie a loop to use as a hunger. Step 8: Hang your wreath. Step 9: Optional - add some fresh flowers, but make sure to use the florist water vials or the flowers will dry out.